“I don’t know”, “I’m indifferent”, “I don’t mind”. I say these things a lot. Sometimes it irritates people, because they think I’m holding back my opinion for some reason. But when I say things like this (well, when I say anything!) I really mean it. I have quite strong opinions about some things. Even some things which people think are weird or silly, or things people think are too big and complicated to have a simple opinion about. Put it down to ‘black-and-white thinking’. Because of this, I’m also really good at knowing when I have an opinion and when I don’t. I don’t really have to pause and think about something carefully before working out whether I have an opinion. I might have to think for a while to work out what my opinion is – especially if I have to make a decision. But otherwise, I can answer very quickly when my answer is “I don’t know” or “I don’t care”. It’s as if my ability to have an opinion or preference about something is digital – whereas for most people it’s analogue. 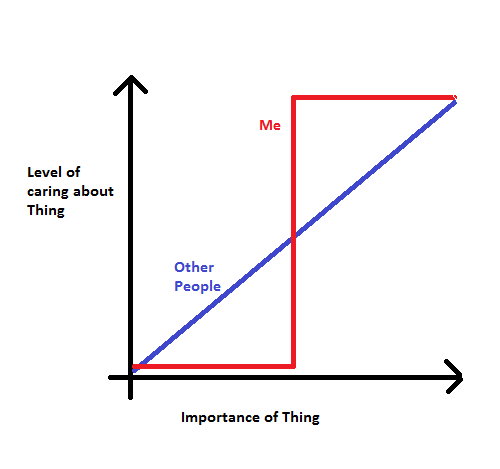 The red line is me, and the blue line is most other people. I go from “not caring at all”, to “caring completely” in one big jump. Whereas most people have a gradual progression from “not caring at all”, to “caring a little bit”, “caring a fair amount”, and so on. This graph explains why there are some things I don’t care about at all, which most people do care about a reasonable amount. And also why there are some things that people think I care too much about. And it explains why it’s very easy for me to work out whether or not I have an opinion on something. Which side of the line does it fall on? Whereas other people have to decide what level of opinion is worth expressing or worth doing something about – halfway up? A quarter? Three quarters? It must be a nightmare! Of course it’s sometimes annoying to have a digital experience of opinions and preferences, too. Sometimes people ask what I’d prefer and I say that I don’t mind and they just refuse to believe me. “You must have some preference!”, “Even just a little bit?”, “It’s OK for you to choose what you want!”. Sometimes not having a preference makes decisions a lot harder – maybe this is why it takes me a long time to make decisions in the first place? It would be a lot easier to decide how to do things if I had some kind of emotional response to the options. That’s probably part of the reason that I rely on habit and routine, too. It’s a lot easier than contorting my digital thinking to try and formulate an opinion about something minor. And then there’s all the things on the other side of the line – the “caring too much” side. Because I often don’t express an opinion, it sometimes surprises people when I do. And they think I’m exaggerating or joking or being silly for caring so much about something. It seems like the ‘conclusion’ for this is going to be much the same as usual: communication and acceptance will improve anything! If people understand and believe me when I say that I do or don’t care, then… everything would be fine, I guess. It is really irrelevant whether people believe what we believe, sure it would be nice and tidy if everyone understood everyone, but the reality is that we don’t. Most of the time the other party isn’t listening at best. I relate to you saying that you don’t express an opinion on purpose. But I do tend to have an opinion whether I chose to share it or not is another story. I usually take a longer time than most to make a decision. That’s life. I don’t apologise for that. My variables are wider than most people. Oh wow, I didn’t realize that I wasn’t the only one who did that. Thank you! Like weird autist, it’s nice to know I’m not alone. But sometimes I say “I don’t know” or “I don’t care” like other people do as well – in order to hold back my opinion. And the problem is, people can’t tell the difference between the latter and the former. If I say “I don’t know” and really don’t have a preference, I get the same reaction you get. And if I really don’t feel comfortable expressing my opinion, I can’t think of what else to say that will satisfy people and shut them up. Not only that, but there are other reasons I say such things, as well. Sometimes, I care deeply about a situation, but I STILL don’t know. Either I don’t have adequate information to make a decision, or both options seem to cancel each other out, yet neither sound worth doing, and I keep hoping that a third option is available, or that one option will present itself if I get enough information about it.